Looking for an engagement or wedding gift? This frame is the one! Fused art glass decorates this beautiful, frosted glass frame. 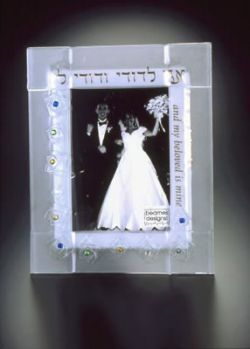 This contemporary design is a geometric pattern of layered glass with dichroic highlights and gold lettering in English & Hebrew � �Ani L�Dodi V�Dodi Li�, �I am my beloved�s and my beloved is mine�. This frame fits a 5x7 photo, outside dimensions are proportionally larger. Easel backs sits vertically or horizontally. Made in the USA by Sara Beames.